With his stylish Z and the easy nickname Zeke, can’t you imagine boys answering to this Biblical appellation? 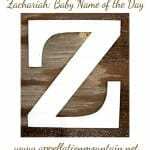 Thanks to Zoe for suggesting Zechariah as our Baby Name of the Day. My first question – and maybe yours – is whether Zechariah is really a separate name. He’s one letter away from Zachariah, and that makes him awfully close to Top 100 staple Zachary. Turns out that Zechariah is the original. Surprised? Me, too. The original Hebrew means “God remembers,” and is typically transliterated with an e, not an a. Chances are that the spelling varied over the years, but when the King James version of the Bible was produced in the early 1600s, Zechariah definitively became Zachariah. The scholars translated the Old Testament directly from Hebrew, and there are countless examples of spelling changes from previous English-language editions. This leads to a puzzle: Zachary seems like it must be the medieval form of Zachariah, just as Cecily evolved from the common English form of the Latin Cecilia. But none of the names were common in England until after the Reformation. 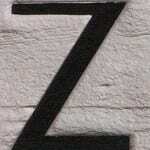 In any case, there’s more than one Biblical Zechariah. The most prominent one was a prophet, and lent his name to the Book of Zechariah. He lived in the sixth century BC, during the reign of King Darius. His prophecies covered the future coming of the messiah, as well as end times. He may have lived in the fifth and sixth centuries BC, and there’s a tomb in Israel said to be his final resting place. It’s located on the Mount of Olives in Jerusalem and has been considered a holy site for ages. Only problem is that modern archeology tells us that the tomb was probably built in the first century AD, and was used as a burial place as late as the 300s or 400s. Instead, Zechariah may be buried in an ancient church that is only now being excavated. A second figure wore the name in the New Testament. 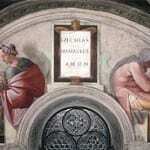 The dear old dad of John the Baptist was typically referred to as Zacharias, yet another variant of the name. That’s him pictured in the Russian icon in this post. Style-wise, he fits right in with Old Testament names climbing up the charts in recent years. Elijah, Isaiah, Zechariah. While he’s still many paces behind the most fashionable of Biblical boys, Zechariah leapt from #717 in 2011 to #661, suggesting that he’s being rediscovered. One possible reason for his new found popularity? The easy nickname Zeke. Ezekiel ranked #198 in 2012, and Zeke came in at #874. Zeke has that hickster style, a certain Southern-fried flair. But his Z keeps him modern, too. With Parenthood patriarch Zeek Braverman on the small screen since 2010, there’s plenty of buzz about this name. Factor in our long affection for Zachary (#68 in 2012, and Top 100 since 1976), and Zachariah (#437 in 2012), and no wonder Zechariah is attracting attention. If you’re looking for an Old Testament name that’s relatively underused but easier to wear than Obadiah, Zechariah is a great option. I think Zechariah is a great name. I love it in the middle position. I think it’s one of those middles that could go with a lot and yet stay as an unexpected surprise.